Suitable α-olefins include for example, α-olefins containing from 2 to about 20, preferably from 2 to about 12, more preferably from 2 to about 8 carbon atoms. Particularly suitable are ethylene, propylene, butene-1,4-methyl-1-pentene, hexene-1 or octene-1 or ethylene in combination with one or more of propylene, butene-1,4-methyl-1-pentene, hexene-1 or octene-1. These α-olefins do not contain an aromatic moiety. wherein R1 is selected from the group of radicals consisting of hydrogen and alkyl radicals containing from 1 to about 4 carbon atoms, preferably hydrogen or methyl; each R2 is independently selected from the group of radicals consisting of hydrogen and alkyl radicals containing from 1 to about 4 carbon atoms, preferably hydrogen or methyl; Ar is a phenyl group or a phenyl group substituted with from 1 to 5 substituents selected from the group consisting of halo, C1-4-alkyl, and C1-4-haloalkyl; and n has a value from zero to about 4, preferably from zero to 2, most preferably zero. Exemplary vinyl or vinylidene aromatic monomers include styrene, vinyl toluene, α-methyl styrene, t-butyl styrene, chlorostyrene, including all isomers of these compounds, and the like. Particularly suitable such monomers include styrene and lower alkyl- or halogen-substituted derivatives thereof. 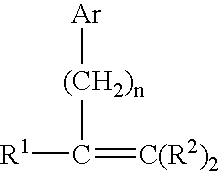 Preferred monomers include styrene, α-methyl styrene, the lower alkyl-(C1-C4) or phenyl-ring substituted derivatives of styrene, such as for example, ortho-, meta-, and para-methylstyrene, the ring halogenated styrenes, para-vinyl toluene or mixtures thereof, and the like. A more preferred aromatic monovinylidene monomer is styrene. Examples of suitable catalysts and methods for preparing the substantially random interpolymers are disclosed in EP-A-0,416,815; EP-A-514,828 (U.S. Pat. No. 6,118,013); EP-A-520,732 (U.S. Pat. No. 5,721,185); as well as U.S. Pat. Nos. 5,055,438; 5,057,475; 5,096,867; 5,064,802; 5,132,380; 5,189,192; 5,321,106; 5,347,024; 5,350,723; 5,374,696; and 5,399,635; 5,470,993; 5866,704; 5,959,047; 6150,297; and 6,015,868; all of which U.S. patents are incorporated herein by reference. The substantially random α-oelfin/vinyl or vinylidene aromatic interpolymres can also be prepared by the methods described in JP 07/278,230, or by the methods described by John G. Bradfute et al. (W. R. Grace & Co.) in WO 95/32095; by R. B. Pannell (Exxon Chemical Patents Inc.) in Wo 94/00500; and in Plastics Technology, p. 25, (September 1992), all of which are incorporated herein by reference in their entirety. Component B comprises one or more low MW (molecular weight) polymers such as for example a low molecular weight polystyrene (PS), tackifier resin, or wax, with average molecular weight (Mn)<10,000, preferably <5,000, most preferably <2,000. aCatalyst A is (1H-cyclopenta[l]phenanthrene-2-yl)dimethyl(t-butylamido)-silanetitanium 1,4-diphenylbutadiene) prepared as described in Example 3 of USP No. 6,150,297, incorporated herein by reference. All blends were first dry blended thoroughly before compounding. A Haake Polylab system equipped with a Berstorff PTW/25P twin screw extruder was used for compounding. Typical extruder temperature was 160-190° C. at an output rate of 12-22 lbs/hr. The water bath temperature was 5° C. The composition of the blends is expressed as weight % based on the total weight of the blend components. Table 3 presents a summary of statistical results for the evaluation and analysis of dimensional characteristics. Shrink is evaluated using mean percent shrink and shrink inch/inch statistics. Dimensional variation is evaluated with maximum, minimum, standard deviation, and S/N ratio nominal-the best statistics. As shown, shrink for the I-beam patterns made of the CASPER blend of Experiment Number 5 pursuant to the invention is significantly less than that for I-beam patterns made of the polystyrene and conventional wax pattern materials. This characteristic may affect pattern tool design without increasing costs for use in investment casting process. More importantly, the dimensional variation for the I-beam patterns made of the CASPER blend is equal to that for I-beam pattern made of the conventional polystyrene pattern material and 3 to 6 times less than that for pattern wax materials. As presented, the standard deviation of 5.500 inch I-beam feature is 0.0005 inch for the CASPER blend I-beam pattern compared to 0.0017 and 0.0032 for I-beam patterns made of wax materials 5042 and 5038, respectively. The CASPER blend pursuant to the invention will provide all the advantages of rigid polystyrene pattern material in terms of room temperature strength, dimensional stability, and greatly reduced dimensional variability as compared to pattern wax materials. 1. Combination of a fugitive pattern having a shape of an article to be cast from a metal or alloy and a shell mold invested on the pattern, wherein said pattern comprises a pattern material comprising A) a substantially random interpolymer prepared by polymerizing one or more α-olefin monomers with one or more vinyl or vinylidene monomers and B) a low molecular weight polymer other than said interpolymer. 2. The combination of claim 1 having an injection molded shape of said article. 3. The combination of claim 1 wherein said pattern has a shape of a gas turbine blade or vane. 4. The combination of claim 1 where said pattern has a melt flow rate of 350 or greater by ASTM D1238. 5. The combination of claim 1 wherein the pattern has reduced dimensional variation as an I-beam pattern shape as compared to a wax pattern as an I-beam pattern shape. 6. The combination of claim 1 wherein the pattern has higher strength as compared to a wax pattern. 7. The combination of claim 1 wherein the pattern has higher toughness as expressed by less brittleness as compared to a wax pattern. 8. The combination of claim 1 wherein the pattern has a lower shrink as compared to a wax pattern and a polystyrene pattern. 9. The combination claim 1 wherein said interpolymer comprises ethylene/styrene interpolymer. 10. The combination of claim 9 wherein said low molecular weight polymer comprises low molecular weight polystyrene. 11. The combination of claim 1 further including a thermoplastic polymer other than said interpolymer and said low molecular weight polystyrene. 12. Combination of a fugitive pattern having a shape of an article to be cast from a metal or alloy and a shell mold invested on the pattern, wherein said pattern comprises a pattern material comprising A) a substantially random interpolymer and B) a low molecular weight polystyrene. 13. Combination of a fugitive pattern having a shape of an article to be cast from a metal or alloy and a shell mold invested on the pattern, wherein said pattern comprises a pattern material comprising A) ethylene/styrene interpolymer and B) a low molecular weight polystyrene. 14. The combination of claim 13 wherein said ethylene/styrene interpolymer is present in an amount of 10% to 95% by weight of said pattern material and said low molecular weight polystyrene is present in an amount of 5% to 60% by weight of said pattern material. 15. The combination of claim 14 wherein said ethylene/styrene interpolymer is present in an amount of 30% to 80% by weight of said pattern material and said low molecular weight polystyrene is present in an amount of 10% to 50% by weight of said pattern material. 16. The combination of claim 15 wherein said ethylene/styrene interpolymer is present in an amount of 50% to 70% by weight of said pattern material and said low molecular weight polystyrene is present in an amount of 20% to 50% by weight of said pattern material. 17. The combination of claim 16 wherein said ethylene/styrene interpolymer is present in an amount of about 60% by weight of said pattern material and said low molecular weight polystyrene is present in an amount of about 40% by weight of said pattern material. 18. The combination of claim 13 wherein the low molecular weight polystyrene has a molecular weight (Mn)<10,000. 19. The combination of claim 18 wherein the average molecular weight is <5,000. 20. The combination of claim 19 wherein the average molecular weight is <2,000.